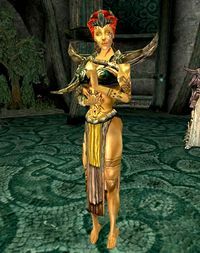 Almalexia, also known as Almalexia the Lover, Almalexia the Warden, and Ayem, was one of the three God-Kings who constituted the Tribunal, or Almsivi, along with Vivec and Sotha Sil. She was very popular amongst the Dunmer, who called her "Healing Mother", "Lady of Mercy", and "Mother Morrowind". They knew her as the source of compassion, sympathy, and forgiveness, the protector of the poor and weak, and the patron of teachers and healers. She resided in the temple city of Mournhold within the city of Almalexia, the capital of Morrowind, and was closely associated with House Indoril. She was also the most personable of the Tribunal, and was well-known for walking amongst her people. As a mortal, she was the wife of Lord Indoril Nerevar, First Councilor of Resdayn. As a living god, she became the consort of Vivec, who associated her with the stars. Originally the counselors to Nerevar, the Tribunal came to power amongst the Dunmer following her husband's death at the Battle of Red Mountain circa 1E 700. Before his death, they swore oaths to Nerevar upon Azura that they'd never use the Tools of Kagrenac on the Heart of Lorkhan in order to steal its divine essence for themselves. A few years later, Almalexia and her fellow Tribunes broke that oath to become living gods. This led to the transformation of the Chimer into the Dunmer, and the Tribunal became their immortal protectors, leaders, and gods. The truth of how they gained their divinity was covered up; according to the Heirographa, the orthodox public teachings of the Tribunal Temple, their divinity was a more spontaneous result of their supernatural virtue, discipline, wisdom, and insight. The power of Almalexia and the other Tribunes declined during their struggle with Dagoth Ur throughout the Third Era, and Almalexia eventually lost her mind along with her power. During the time of the Nerevarine Prophecies in 3E 427, she killed Sotha Sil and then died in a failed attempt to kill the Nerevarine. Little is known of Almalexia before she became Nerevar's wife. Temple myth holds that on Mount Assarnibibi, Molag Bal oversaw the ninety-nine lovers of Boethiah who gave birth to her. She hailed from one of the Great Houses of Morrowind. Vivec's prose suggests she was already a ruler when she met Nerevar, who was working as a guard for a merchant caravan at the time. Though Nerevar was a generation older than her, they eventually got married. 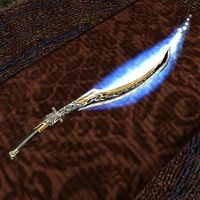 The Dwemer king Dumac, who had become Nerevar's close friend, presented them with twin blades of the highest Dwemeri craftsmanship. Almalexia's was known as Hopesfire. Sources conflict on how her husband met his demise. Most attribute it to wounds he received during the Battle of Red Mountain. The Ashlanders, who rejected Tribunal worship, believe that Almalexia and her fellow Tribunes murdered her husband so he would not interfere with their plan to take divine power. As soon as the Tribunal stole power from the Heart, Azura appeared and cursed them. The Daedric Prince issued the prophecy that the Nerevarine would return to punish them for breaking their oaths. When Sotha Sil waved off her omens, the Dunmer were created, and Azura gave a final prophecy: that the Dunmer would share the Tribunal's fate until the end of time. Though confused at first, the Dunmer (with the exception of Ashlanders) did come to accept the Tribunal as their new gods. Theological concerns gave rise to the idea of the "Anticipations", the "Good Daedra" the Chimer had worshipped before the Tribunal's apotheosis (so while the Tribunal had once been mortal, and non-existent before that, their Anticipations were said to have guided the Chimer in their stead). The Good Daedra are those Princes of Oblivion who apparently acknowledged the Tribunal's authority over the Dunmer (as opposed to the Bad Daedra, spirits who did not accept the Tribunal). The Anticipation of Almalexia was Boethiah, Prince of Plots. Almalexia wielded her divine power for the protection and benefit of the Dunmer for thousands of years. Sotha Sil largely remained aloof and mysterious, but Almalexia and Vivec both took very active roles in leading their people throughout the First and Second eras. Her acts of amazing power and kindness are countless. Her blessing was said to do extraordinary things, like protect a person infected with Corprus from suffering the disease's effects. Saint Felms the Bold is said to have been inspired by the voice of Almalexia in his head. The Hands of Almalexia were her personal guard, and were often called the greatest warriors in all of Tamriel. Like Vivec, she wrote extensively, though she focused on children's fables and similar works meant to nurture the morality of her people rather than Vivec's more cerebral, spiritual guidance. In 1E 2920, Mehrunes Dagon destroyed the city of Mournhold. After an epic battle, he was defeated by Almalexia and Sotha Sil. This was portrayed in the historical fiction 2920, The Last Year of the First Era, which also suggested Almalexia foresaw in her dreams the end of the Four-Score War, as well as the end of the Reman Dynasty. In 2E 572, Almalexia fought alongside Wulfharth, also known as the Underking, against Ada'Soom Dir-Kamal during an Akaviri invasion of northern Tamriel. Sources seem to disagree on certain aspects of this conflict. Mysterious Akavir treats Morrowind as the target of the Akaviri invasion, though Skyrim was apparently the Akaviri's initial target. The Arcturian Heresy claims Almalexia was the one who summoned the Underking to fight alongside the Tribunal (even though in life, he had been one of their greatest enemies). Jorunn the Skald-King contradicts this, crediting the Greybeards with summoning the Ash-King. The book also claims that Dir-Kamal's army was crushed by several Tamrielic military forces, not just the Dunmer army under Almalexia's command, and that this occurred at a place called Stonefalls. The other sources don't mention the Nordic or Argonian forces which played roles, and Mysterious Akavir says Dir-Kamal was defeated at Red Mountain. Following the Akaviri invasion, Almalexia was a strong supporter of the formation of the Ebonheart Pact. It was she who convinced the Great Houses (sans Telvanni) to join the Pact. During the Alliance War of 2E 582, Deshaan was threatened by a cult known as the Maulborn, who sought to topple the Tribunal and return the Dunmer to Daedra worship. They were led by Magistrix Urili Vox, once a handmaiden of Almalexia who turned against her following her son's execution. The insurgents were ultimately put down. In 2E 882, Dagoth Ur awoke beneath Red Mountain. The former Lord High Councilor of House Dagoth had been thought dead, but through unknown means, he had actually forged his own connection to the Heart of Lorkhan, drawing divine power from it just like the Tribunal did, and was merely sleeping. When the Tribunal arrived at the mountain for their annual ritual bath to replenish their power, Dagoth Ur and his minions attacked them and drove them away, decisively cutting them off from access to the Heart. The Tribunal would spend almost four hundred fifty years, virtually all of the Third Era, slowly losing ground to him. Their preoccupation with what had become the Devil Incarnate for the Dunmer people is perhaps one reason why Vivec avoided war with Tiber Septim and signed the Armistice, making Morrowind an autonomous province of the Third Empire. With the advent of Imperial rule in Morrowind, Mournhold became a town of two minds: there was the monarchy led by the Imperial-appointed king, and the Temple led by Almalexia. While there has been no open hostility between the two, there were always undercurrents of tension. The power mainly stayed with the Temple, and the monarchy seemed to acquiesce to this reality (the king was, after all, the vassal ruler of the Empire, and Morrowind had retained its autonomy under the terms of the Armistice). However, many feared the violence that would ensue should the king ever attempt to challenge Almalexia's authority. The Tribunal made seasonal campaigns to Red Mountain, and slew Dagoth Ur and his kin, the ash vampires, though the Heart always revived them in time. Almalexia had always had a tendency to brood, and without access to the Heart of Lorkhan, her divinity ebbed. This weighed heavily on her, and she became a harsher, more unsympathetic patron. She stopped walking among her people around 3E 377. When the Tribunal realized they couldn't defeat Dagoth Ur, they built the Great Ghostfence to contain him around 3E 417. This seemed to work, until Almalexia and Sotha Sil were attacked during a campaign and lost two of the Tools of Kagrenac, Sunder and Keening. Though Vivec rescued his fellow Tribunes, the Tools were lost, and both the real impact of their loss and what it signified proved crippling. Almalexia and Vivec stopped communicating. 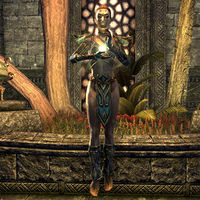 Vivec grew concerned that she would pose a danger to herself and others, and might even try to harm him. Almalexia ceased appearing in public altogether, and the incident was the last known time Sotha Sil was seen alive. Vivec was left to spearhead the fight against Dagoth Ur alone. The Tribunal was undone. Almalexia had changed. Those few who still saw her noticed that she had begun to act more like a warrior queen than the Lady of Mercy. Those closest to her knew that she had turned into a whole different person, one who was obsessed with maintaining power at the expense of everything else. In lieu of divine power, Almalexia exploited her knowledge of ancient and powerful relics to inflict terrible punishments on her people for what she perceived as their lack of faith, such as by using Dwemeri machinery to cover her capital city in ash storms. But in her madness, she concocted a new goal: to become the one true god of the Dunmer, uniting all of her people under one faith and authority - and destroying any who interfered. When the Nerevarine came to Mournhold after Dagoth Ur's fall in 3E 427, Almalexia sought to trick, entrap, and destroy him as part of this plot. She first turned on Sotha Sil and slew him in his Clockwork City, then unleashed its mechanical inhabitants into her own city in order to frame her old friend. Her ruse lured the Nerevarine to Sotha Sil's legendary home, where she hoped that the reincarnation of her husband would be killed by the inhabitants. When the Nerevarine persevered, Almalexia tried to finish the job herself. But her powers failed her, and she died at the Nerevarine's hand in the Clockwork City. Though Almalexia would call Vivec a fool in her final hours, Vivec, the last remaining Tribune, only held pity for his fallen, deranged lover. By 4E 201, the last vestiges of Almalexia's marks were gone from Mournhold. The Dunmer returned to the veneration of Boethiah, now called one of the "Reclamations", and managed to make their way without their Healing Mother watching over them. Almalexia is still remembered and honored as one of the greater saints of the Dunmeri faith, but not one who was ever supposed to be one of the cornerstones of the religion. According to Azura, the death of Almalexia was a boon for all of Morrowind, even if the people didn't understand it at the time. The Daedric Prince professed that the Lady of Mercy would have betrayed the Dunmer as surely as she had betrayed all those she loved, for this was her true curse. For game-specific information, see the Tribunal and Online articles. ^ a b c d e f g Vivec's dialogue in Morrowind. ^ a b c Almalexia's dialogue in Tribunal. ^ Barenziah's dialogue in Tribunal. ^ Galsa Andrano's dialogue in Tribunal. ^ a b Mehra Helas' dialogue in Tribunal. ^ Effe-Tei's dialogue in Tribunal. ^ Salas Valor's dialogue in Tribunal. ^ a b Azura's dialogue in Tribunal. ^ Galdrus Hlervu's dialogue in Dragonborn. Esta página foi modificada pela última vez à(s) 16h52min de 6 de dezembro de 2017.